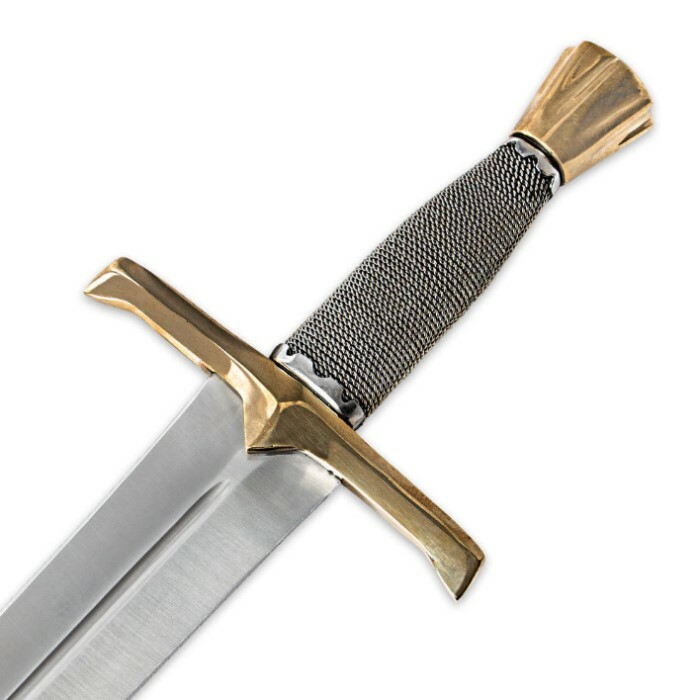 Renaissance Revival Medieval Sword Wire Wrapped Handle | BUDK.com - Knives & Swords At The Lowest Prices! Add an historic edge to your Medieval sword collection with our Renaissance Revival sword. This stunning sword features a 22-1/4" double-edged stainless steel blade with a handsome satin finish, sharp edges and a piercing point. The oversized brass guard protects your hand from slipping to the powerful blade, and the wire-wrapped handle is completed by a decorative brass pommel. Store and carry it in the included leather scabbard. 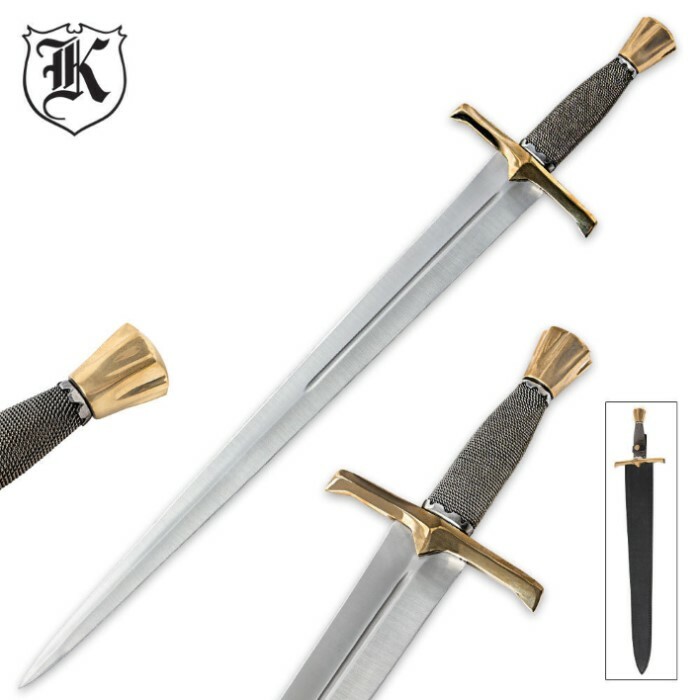 This is a solid "king Arthur" short, or perhaps medium length, sword. (22 inch blade, so you decide what to call it) It has a real brass guard and pommel. It is a great looking sword. It has a twisted steel wire-wrapped handle. It has a hollow ground stainless steel blade that is sharp right out of the box. And the blade rings like a bell when you flip it. That might not mean anything, but I think it is cool. It is almost identical to my all time favorite Bud K sword BK2610, but this is way cheaper because it is not Damascus (and a little smaller). My only, and really, very minor, complaint is that the little petal-like spacers on the grip which are not as well finished as on the smoothly finished BK2610, and the swordmaker left little sharp metal edges which stick up a little and are just a little rough and uncomfortable. I spent 20 minutes with a file on the dozen or so sharp little petal edges, and then tapped them a little farther down to completely flush on the handle with a small hammer. Now it is smoother and the edges barely noticeable. This sword feels totally battle ready, but without knowing for sure whether or not it has a full or even decently long tang, I would not trust my life to it in the fighting pits of Cimmeria. I can't tell with my trusty magnet, as I usually do, as the handle is totally wrapped with twisted steel wire. I like this sword a lot. I give it 5 stars. I have yet to find the perfect sword for under $300, but this comes pretty close to the mark. Out of the box it was sturdy, strong, and had a decent edge. It had a handsome look to it, and secure feel. I wish it was a little longer, but for $40 who's complaining? For you people who seriously abuse your weapons, I don't recommend it. It's a good sturdy replica, meant for show, and perhaps minimal chopping. No actual sword fighting. Overall very pleasing, especially for the low price.